Since 2000, Forbes has taken an admirable crack each year at recognizing the most successful dealmakers in high-tech venture capital. 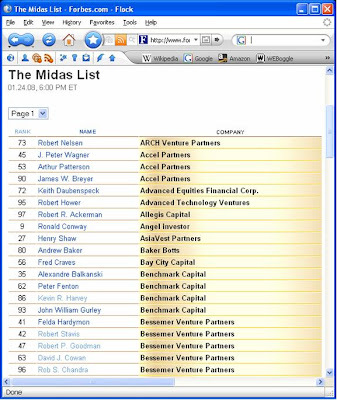 Its Midas List attracts some controversy (and whines from VCs) since Forbes must craft its list based on incomplete and somewhat self-reported information. Clearly some folks get too much credit (e.g. I've been ranked as high as number 6, although this year I lost ground) and some star performers are neglected, such as Chris Gabrieli (Sirtris IPO), Gus Tai (sold Photobucket to FIM), and Kevin Harvey (sold MySQL, TellMe, Ingenio), who should have fared better than number 86. With that disclosure, I wish now to point out that five Bessemer investors (including Bob Goodman, Rob Stavis, Rob Chandra and Felda Hardymon) made this year's list, once again making Bessemer the #1 represented firm.